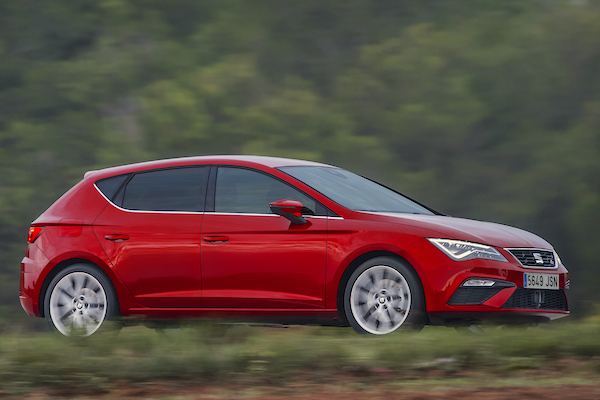 The Seat Leon is the best-selling vehicle in Spain for the 5th straight year. Consult over 45 years worth of Spanish Historical Data here. The Spanish new car market enjoys a 6th straight year of growth in 2018 at +7.5% to 1.334.085 registrations. This is the largest annual result in 11 years, since the 1.615.201 units of 2007. Spanish sales have recovered spectacularly from the low of 2012 (700.562), now standing at almost double that volume (up 90%to be exact) and just 19% below the record high of 2005 (1.647.837). Like in 2017, the 2018 market is pulled up by business sales gaining 14.2% to 415.887 and 31.2% share vs. 29.3% a year ago, rental sales almost match the market at +5.7% to 237.979 and 17.8% vs. 18.1% while once again private sales fall behind the market growth but remain in frank positive at +4.3% to 680.219 and 51% share vs. 52.5% in 2017, 54.3% in 2016 and 56.6% in 2015. Gasoline sales surge 32.3% to 840.114 and 63% of the Spanish market vs. 51.1% a year ago whereas diesels sales freefall 19.6% to 482.157 and 36.1% vs. 48.3% in 2017 and EVs are up 62.9% to 11.814 deliveries. In terms of segments, this year compact SUVs have become the most popular thanks to sales soaring 69% to 323.272, leapfrogging superminis (+1.1% to 280.240) and compact cars (-3.4% to 270.279) while small SUVs are the most dynamic at +66.7% to 149.619. 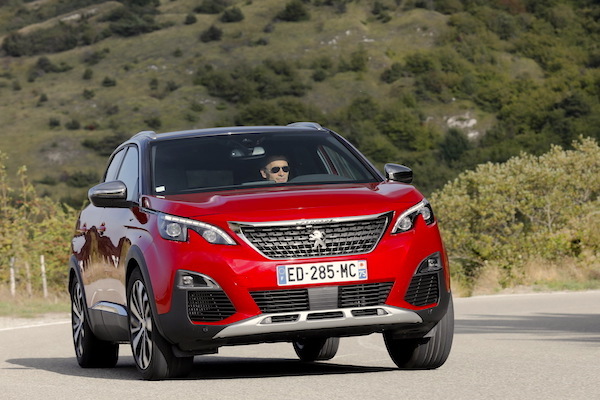 The Peugeot 3008 recorded its first monthly win in Spain – and any major world market – in September. Homegrown carmaker Seat (+13.6%) reclaims the brands top spot at home for the first time since 2011, with the entire podium posting sturdy double-digit gains: Volkswagen (+14.9%) and Peugeot (+15.6%) also advance one spot, all this little world benefitting from the stumbling of 2017 leader Renault (-5.4%), down three ranks to #4. Opel (-7.6%) is the only other Top 10 carmaker to lose volume year-on-year but remains put at #5. Hyundai (+16.8%), Kia (+15%) and Citroen (+11.9%) also sign brilliant results in the remainder of the Top 10, Toyota (+7.5%) matches the market while Ford (+1.3%) is weak but up. Further down, notice the excellent performances of Lotus (+233.3%), McLaren (+175%), Jeep (+102.5%), Subaru (+40.5%), Abarth (+26.6%), Mitsubishi (+24%), Jaguar (+23.7%), Skoda (+18.5%), Lexus (+18.2%), Volvo (+17.8%) and DS (+17.6%). 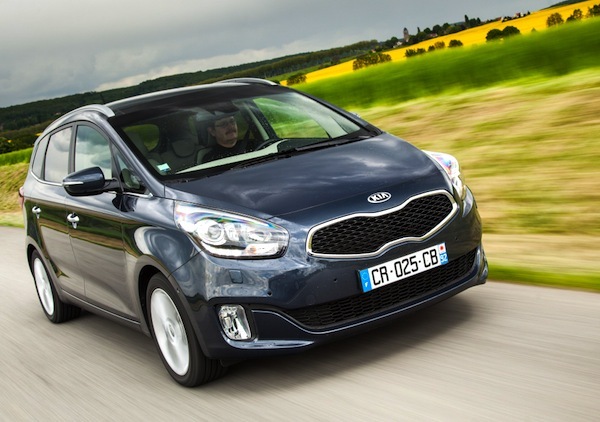 Freak event in a pre-WLTP-filled August: the Kia Carens ranks #1 in Spain. Model-wise, the Seat Leon (-1.2%) manages a 5th consecutive annual pole position at home despite only topping the monthly ranking 3 times like in 2017, distancing the Seat Ibiza (-6.9%) which ranked #1 twice. This is the 13th year in a row the Ibiza ranks inside the Spanish Top 2 and its 24th consecutive podium finish – the last time the Ibiza ranked below #3 annually at home was 24 years ago in 1994. The Nissan Qashqai (+8.8%) and Dacia Sandero (+16.1%) both outpace the market and knock the Renault Clio (-0.3%) down two ranks to #5. The VW Polo (+18.1%) is up two spots to #6, snapping the monthly pole position twice this year and overtaking the VW Golf (-1.3%). The best performer in the Top 10 is the Peugeot 3008 (+47.6%), scoring its first ever monthly win in September which turns out to also be the nameplate’s first win in a major world market. The Peugeot 2008 (+16.3%) also impresses and breaks into the annual Spanish Top 10 for the first time. A pre-WLTP stock clearance rush in August uncharacteristically lifted the Kia Carens (+36%) to #1 – the first time a Korean model held that spot in Spain – ending the year at #37. The Seat Arona (#17) managed to break into the monthly Top 10 three times, peaking at #6 in October, with the Citroen C3 Aircross (#35), Hyundai Kona (#41), VW T-Roc (#42) and Kia Stonic (#46) also ending their first full year in the Spanish market inside the Top 50. Notice also the Toyota C-HR (+46.8%), Fiat Tipo (+33.5%), Fiat 500 (+29.1%), VW Tiguan (+25.5%), Toyota Yaris (+14.1%) and Mercedes A-Class (+13.3%) posting strong scores near the top. Full Year 2018 Top 57 All-brands and Top 400 All-models vs. Full Year 2017 figures below. Full December 2018 Top 42 All-brands and Top 285 All-models below.